2. The house are designed with a greater concern for the privacy of every room from the road and the surrounding buildings. 3. Good cross ventilation and excellent natural lighting. 4. Kitchens with attached service balcony. 5. Sufficient loft, storage spaces and wardrobes. 6. Excellent pure drinking bore water. 7. Surrounded by apartments and residential buildings. 8. 10 minutes walk from New Bus Stand, Yagappa, Kamala Subramaniam Schools & Bharath, Serfoji, Medical, Tamil University Colleges. 9. Locality with a 24 hours transport facility. Anti Termite / Pest Control / Water Proofing treatment given. 6passenger Lift with V3F technology. Auto Control on / off for OHT motor & sump motor. Inverter line provided for every flat. Intercom Facility to communicate to other flats. Common Coin Box Phone / Toilet / Bathroom provided at car park area. Safe earthing for uninterrupted power fluctuations. Separate 3 phase power connection for every flat. Master Bed Room toilet provided with Shower enclosure / Partitions for Duplex homes, Kitchen provided with sufficient shelves, separate Grinder, Mixie RCC Slab & SS Sink. Spacious Lofts / shelves / Shoe Rack provision, etc. Fire Retardant Low Smoke (FRLS) copper wire with Modular switches. Provided sufficient number of Fans, Lights, Exhaust Fans, Night Lamps, etc. 5 amps / 15 amps Power socket provision for AC/Fridge/Oven/Mixie/Grinder/Water Heater/Washing Machine, etc. Health faucet & Hand rill(for aged persons) in Bath / Toilet. Inside / Outside cloth Hanger, provision for Oonjal & hooks in Bed room, hall & balcony. Balcony / utility covered with MS grills for extra safety. Chemical treatment given for every bath / toilet floor to arrest water leakage / soaking in below roof, etc. RCC framed structure with 9" & 4 ½" walls, fly ash / brick masonary and Vizag steel. Main door : Polished teak wood frame with Flush shutters. Inner doors and windows : Frame made of African Teak First quality with painted flush shutters. Hardware : Powder coated aluminum hardware for all doors. African Teak First Quality wood frames for windows with MS Grills, pin head glass & mosquito nets. 2' x 2' Premium quality, Vitrified tiles for living, dinning, bedroom & kitchen areas. Glazed tilling up to 7' in bathrooms with anti skid floor tilling. All water lines are of CPVC and rain water lines in PVC. MARC or Equivalent CP Fittings & accessories in all bathrooms. Western Style water closets / Indian Style Closet, 20" x 16" wash basin – Hind ware Star white or Equivalent in all bathrooms (Star White). All wiring through concealed PVC Conduit pipes. Earth: Copper wire earthing using ASHLOCK loops system. Modular box with quality switches. Emulsion interiors and Ace paint for exteriors. 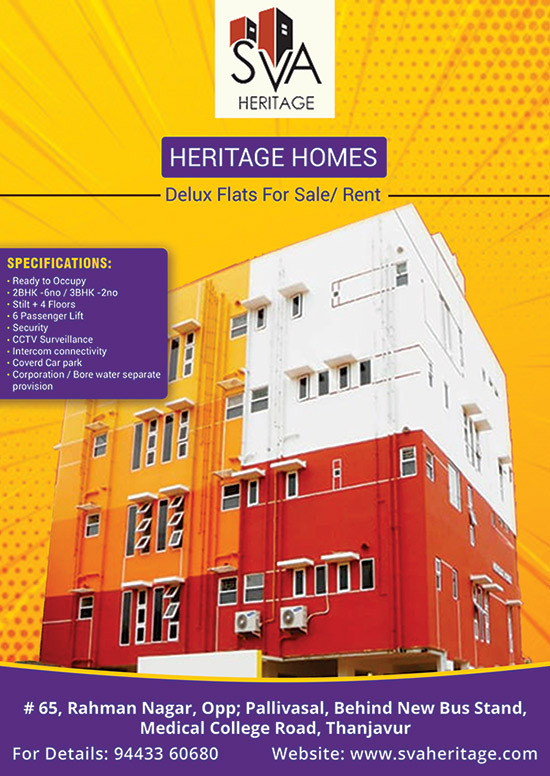 Heritage Homes is located very closer to New Bus Stand, Medical College Road, Tamil University, Leading Colleges, Schools & Air Force. 24 hours Transport connectivity available with sufficient Government Buses & Mini Buses. 5 minutes drive to Ring road, Vallam, etc. Plumber & Electrician available on call. Social interaction & sense of belonging. Centralized pool for post boxes at security custody. 30% on completion of structure of respective unit. 15% on completion of civil works of respective unit.